This is a late post, but I figured it's April, so an Easter post is still appropriate. Easter in Serbia fell on April 15th, and just like Christmas, Chris and I enjoyed celebrating the holiday twice in the same year. On April 8th (Catholic Easter - celebrated in America), we attended an Italian mass at St. Mark's in Venice, Italy and the following Sunday, Darko's mother invited us into their home to celebrate with a traditional Orthodox Easter breakfast. Easter is a special holiday in Serbia because the country found a way to hold onto the Easter traditions and celebrations even through the era of communism. While communism changed a lot of Christmas symbolism, it could not erase the Easter egg. The egg is a symbol of new life and a reminder of Christ's Resurrection from the grave. While in America, superstores are inundated with chocolate or plastic eggs, fluffy bunnies and millions of pink and yellow peeps, in Serbia, the Easter egg is still (for the most part) a real-good-ol-chicken egg. Darko and the Easter eggs! Like in America, Easter eggs are colored in Serbia, but they're usually dyed naturally (so they can be eaten) and the most common color is red because it symbolized joy, happiness, rebirth and the blood of Christ. Families exchange eggs and say, Hristos Voskrese (Christ is risen). The response is Voistinu Voskrese (Indeed He is Risen). This is the same Easter greeting I grew up reciting in my Russian/Ukrainian family, so I was prepared to wow Darko's family with my vast Serbian vocabulary! I got a kick out of ‘tucanje," or the Easter-egg-fight-game where everyone takes an egg and hits everyone else's to see who has the strongest egg in the bunch. Traditionally the exchange of red eggs and the Easter greeting must happen before the meal can begin. This is traditional breakfast/starter Easter food. This meal eventually leads into a spread of meats and heavier food, but we enjoyed the lighter Easter fare. 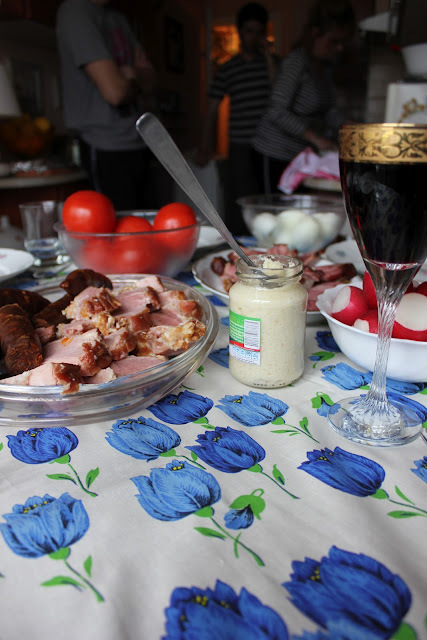 Darko's lovely mother served a spread of pork prepared in various ways, sausage, cheeses, radish, tomatoes, eggs, horseradish, bread and red wine. I was a little homesick for my family, so it was wonderful to celebrate Easter with Darko's family. On our way out the door, Darko handed us a red hardboiled egg, "Lana and Chris, this is your housekeeper." Huh?! Last time I checked, I was the McCoy's housekeeper. "What - do you mean to tell me that this egg is going to clean the house for me?" 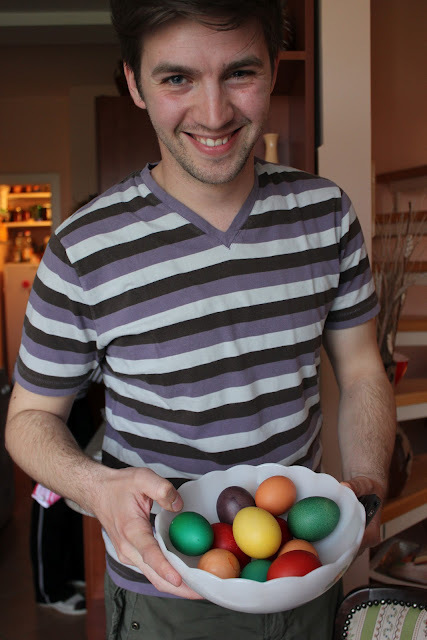 Darko smiled and shared one last Easter tradition with us, "Hahah - no that egg will never clean your home, but it must stay IN your home for the entire year. In Serbia, the first dyed egg is kept until next Easter, guaranteeing family security and health." My little red egg has a proud place on top of our fridge - she is housed inside a tupperware container - just in case the "housekeeper" accidentally falls to her death and breaks. That would stink! Literally! Please post more about what you don't like in/about Serbia. I'd like to hear your insight - there are far too many positive blogs... as a traveler I like to know the cons too! I am working on a "What I Have Learned the Hard Way" post - and I will include some of the difficult things that we have encountered here. For the most part, we have really enjoyed our new home, but of course there are some things that just don't make sense (to us) in any new place. I will delete every negative comment. This blog is really just my "notebook" (if you will) and a place where my family and friends can keep up with how we are doing. I (and most people reading this blog) are well aware of what happened in the past in Serbia, but I want to focus on the good things that are happening here and the great people that we are meeting. Thank you for respecting our wishes. Does This Make me a Sports Fan? !